Ted, aka RWC Wild Fire, is a 9-year-old red fawn male born January 24, 2010. His sire is Kiowa Sweet Trey, and his dam is RWC Bea Quick. He was turned into Amarillo-Panhandle Humane Society by his owner to be euthanized after being hit by a car. 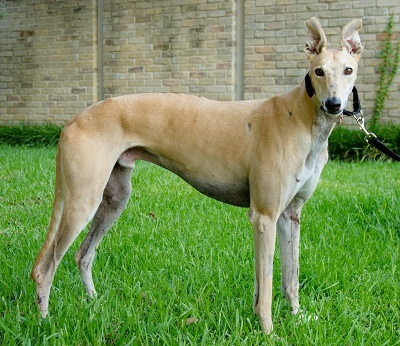 APHS called GALT as the injuries did not seem lethal to them. He had several fractures in his right rear hock and road rash with tissue damage on his front right leg. Ted was medically evaluated by Dr. Jeff Ellis of VCA Preston Park Animal Hospital and Dr. Bob Radasch of Dallas Veterinary Surgery Center. Surgery was performed on February 9, 2016, placing a plate and two screws to stabilize the break. He leg has now healed as well as the wounds from the road rash. Ted developed seizures and the medication he takes is controlling them. This boy has had a rough life, but his future is sure to be an excellent adventure when he finds his forever home! Ted is not considered to be cat tolerant. Ted's surgery to repair his right rear leg was on Tuesday, February 9 by Dr. Tom McNicholas of Dallas Veterinary Surgery Center. A plate with two screws was inserted to stabilize the break. Ted will be receiving weekly bandage changes for the next 6 weeks. X-rays will be taken at the end of the six weeks to determine if the surgery was successful. Ted continues to be treated daily for the "road rash" wounds he received also. 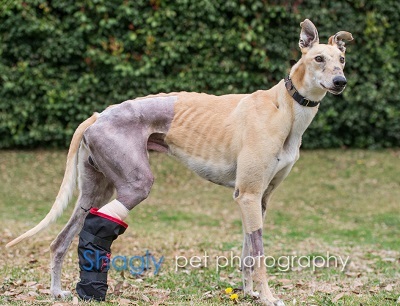 Ted's x-rays reveal his fracture has healed, but he is being leash walked and kept very quiet in his foster home. He will be completing his medical procedures in the next several weeks. 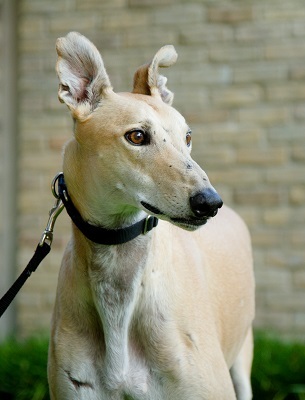 Ted has completed all his medical procedures and is ready to find his forever home. Ted is on daily medication for seizures. He had two seizures after he joined the GALT family, but has not had one since he has been on medication. Ted's seizures returned after several months, and he is now on two daily medications. He may continue to have intermittent seizures. Ted has been seizure-free for almost two years due to proper medication. You can tell by his scars that Ted had a hard life before coming to GALT. When he first came to us, he was shut down and disengaged. Over time he has blossomed with lots of TLC and now he's first in line for affection and attention, pawing at our legs if he isn't getting enough! Ted gets really excited for walks and meals and treats. He gets along fine with other dogs, but is not cat tolerant. He crates well when we're gone and at night. Ted is more of a watch-dog than some greyhounds, barking when someone comes to the door or when we come home, but it's not excessive. Ted is currently on medication to control seizures. It has been over a year since his last seizure! The seizure medication makes him thirstier than usual, so he would do best in a situation where he could have a potty break during the day. He likes to be in the same room as his people, and if all the dog beds are spoken for, he'll plop down on the floor instead of seeking out a bed in another room. Is there space in your heart and home for this special guy?